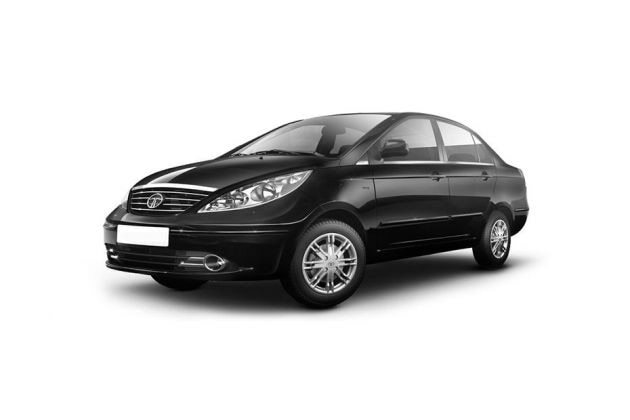 Tata Automotors launched a mid-face lift model of its flagship model Manza. This club class sedan with gets a lot of cosmetic do with chrome inserts and bold headlamps on its exteriors. The advanced Q-jet and S-jet engine makes it a true athletic core power pack. The front fascia of the car defines the style statement with bright chrome hood strip and sharp sharp motorized clear headlamps. Chrome inserts on door and bumper rubrails are new delight to it. The car could be the best in the segment with regards to the features offered at its interiors and exterior ends. The most highlighted attributes of this class model are touch screen audio system, automatic climate control and triple barrel headlamps. It would be a delightful experience every time one steps in the car as the cabin appears fresh and airy with improved roofline and large glasses. The cabin features ample space for leg room and sholuder space. The car gets sophisticated with Italian leather upholstery and chrome details on bumpers and doors. The car is available in five variants- LS, LX, VX, EX, and EXL in both petrol and diesel models. The diesel models are powered by 1.3-liter 4-cylinder common rail diesel engine which follows BS3/BS4 emission norms . This diesel engine churns a maximum power of 90bhp and a torque of 200Nm. . The powertrain of this class sedan model is complemented with C549, 5+1 speed manual gearbox. With the combination of ventilated disk and drum brakes the driver gets power to excise supreme control over this car even in panic situations. The car is packed with numerous features which takes care of occupants safety and security. The car counts high on comfort attributes with tilt adjustable steering, electric HVAC controls, one shot power windows, adjustable seats and much more to explore. The saloon has advanced infotainment system, that offers a pleasurable long drives. The infotainment system would be defined with the presence of 2DIN music system with AM/FM/MP3/CD playback and audio equalizer and Aux-in. The car has a port for USB, audio control panel comes mounted on the steering wheel for drivers convenience. The information system of the car would be signified with the presence of digital clock, ambient temperature indicator, fuel consumption and distance to empty. Tata launched this club class saloon model for a starting price of Rs 5.7lakhs(ex-showroom, Delhi) for it's petrol models. The whole body would run on 15-inches 8-spoked alloy wheels. Five adult persons could happily adjust within its full cabin space. This club model witness an uninterrupted body styling and a mid facelift design. The car gets a chrome garnish at its exterior end that enhance the appeal of this driving machine. The bright chrome hood strip would grab instant attention, at the very first look. The front fascia seems very smooth with chrome finish radiator grille and sharp big headlamps. The headlamps are powered with motorized clear lens headlamps to improve visibility to the driver. There is a chrome strip around the front fog lamps and front bumpers rubrail together makes the front look distinct. Even the license plate gets chrome garnish. The side profile is defined with body colored outdoor handles, body colored door rubrails and body colored bumper rubrails which gets chrome inserts together. The body colored and electrically operated outside rear view mirror match the whole scenario. The chrome finish inside door handles will draw attention of many admirers. The windscreen is complemented with 7-speed front wipers with smart wipe. The finally crafted wheel arches are fitted with 14-inches 8-spoked alloy wheels, which is coved with full steel caps. The rear end is complemented with rear demister and a big boot space. The power full and sharply designed tail lamps complemented with external roof mounted antenna spice up the sporty look of this driving device. The car is comes with roof cement at the top defining its crowning glory. The character line are smooth and is best complemented with tinted glasses. The mesmerizing interiors are outcome of fusion between aesthetics and technology that never stops to captivate and fascinate connoisseur. The interiors seems are just inviting with convenient control, customized and lashed with impressive technology. More horizontal lines and flat surface enhance its wider look, seamless transition from dashboard to the door panel makes it all the makes it remarkable. The seats are an epitome of comfort and are electronically adjustable which comes with intelligent memory package. The cabin appears fresh, elegant and sophisticated with the use of Italian leather for fabric upholstery. The interiors are done in black and plum both imposing an elegant taste. The illuminated key ring hole, front and rear cabin lights gives a special touch to the ambiance inside. There are storage pockets in the front and rear doors, storage tray under co driver seat and bottle holder on the front console. Glove box is integrated with pen and card holders, ventilation is as per standards and has power outlets at front. The car features tachometer with critical reverse indicators, and anti-glare rear view mirror. The sun visor on the passenger side comes integrated with vanity mirror. The infotainment system being much advanced. It comes with touch screen 2DIN music system with AM/ FM/ MP3/ CD playback and audio equalizer. The car comes equipped with satellite navigation system, audio control on steering wheel and much more that comes integrated with four speakers. This sedan model seems very infomercial with the presence of digital clock, ambient temperature indicator, fuel consumption display and distance to empty. The unmatched core strength of this efficient is the outcome of its robust engine. The petrol versions from this business house are named as Safire90 . The car is powered by 1.4-liter 4-cylinder MPFI petrol engine which offers impressively great power of 90bhp at 6000rpm with a maximum torque of 116Nm at 4750rpm at an instantaneous response even at low revs. The powertrain is supplemented with C549, 5+1 manual gear box, that offers swift gear changes. The powertrain follows BS4 emission norm and aligns towards eco edge. The car comes lashed with prevalent combination of Mcpheron strut with coil spring for the front and twist beam with coil and hydraulic shock absorber at the rear end. The car offers the best comfort features in its segment with innovative technological features, first of all the sports seats in leather offering optimized lateral support will delight the traveling experience. This attribute is enhnced with the presence of air conditioner integrated with heater, Electric HVAC control, and tilt adjustable steering. There are power windows on both the front and rear part, and the power windows are operational till 30 seconds even after the is turned off. The traveling experience is made plasurable and comfortable with the introduction of head rests and lumber support for front row seats. The comfort of driver could be analyzed with the flexible features which could help him find the best driving position with adjustable lumber support, and one shot power window on driver side. The safety is a much upgraded attributes which concerns with the adaptive braking system, crash safety , air bags for safety of passengers during panic situation and many more additional features. The safety attribute is never being underestimated in the cars from the business house of Tata. And this top notch variant comes packed with collapsible steering, high mount LED stop lamps, and engine immobilizer. The sedan features child lock for the rear doors, and warning buzzer for open door or such . The facility of central locking and remote controlled keyless entry ensures the risk of theft. The ABS( anti braking system) with EBD( electronic brake-force distribution) provides driver with the power to excise control over this car even in total panic situations. Ultimate designing and unmatched performance in its class segment. The car seems under rated with low price tagging.